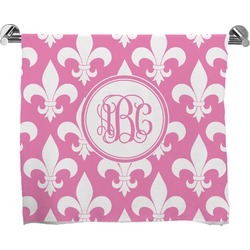 Our personalized bath towels can brighten up your bathroom with their vibrant colors and fun designs. You can use them at home, at the pool, or at the beach!! They would be a lively gift for a college student that needs something large to cover up with while walking to the community bathroom. Their smooth soft surface will feel luxurious as you dry off and the material quickly absorbs moisture from your skin. The towels are slightly larger than standard towels and are perfect for wrapping around your body. Looked very nice; however, I don't know what will happen when it is washed. I would have like a thicker towel, but otherwise, I think it was a cute gift. I had the same comments for this as for the one I ordered in a different design, but the site would not let me repost the review. In summary, personalization and shipping were good, but the towel is too thin to be useful and did not meet my expectations for the price. The personalization was easy to do and turned out well, and the shipping was very fast. I don't think this can fairly be called a bath towel, however, as it is paper thin. For the money, I expected something thicker that could actually be used as to dry off. The customer service was prompt and courteous. The item arrived in a timely fashion. It was personalized, as per my request. I will order other items.